Yesterday, August 25th, a new game was relaeased from Square Enix for the PSP(Playstation Portable) called Dissidia. A fighting game consisting of all the main heroes from the series including the villains. And with it, came a fun impressive soundtrack. Takehuru Ishimoto, Mitsuto Suzuki, Tsuyoshi Sekito, Your Favorite Enemies, Naoshi Mizuta, Hitoshi Sakimoto and Bill Xtillidiex Muir all were able to create new versions of all the original Final Fantasy songs. There were 2-3 songs from each game. Usually battle music or over world music. 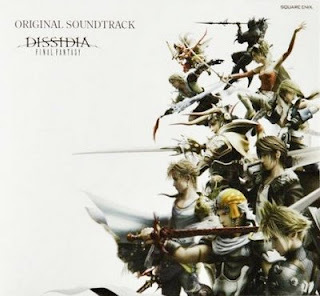 The are also a few brand new songs just for Dissidia. Hearing Uematsu's songs re-done was interesting, enjoyable and even surprising. My personal favorites are "The Order that must be Protected" and "Those Who Fight Further" from FFVII. "The Order that must be Protected" has a melancholy and beautiful sound that sets the game perfectly and "Those Who Fight Further" makes good use of a synthesizer. The soundtrack overall will please any Final Fantasy fan. It's as if you are listening to a whole case of music in tribute to Final Fantasy. Then again, Dissidia is kind of like a tribute to Final Fantasy (in a way). So buy it and here's to cross-overs, victory fanfares, and music that will set you off into a Final Fantasy binge.